We’d love your help. Let us know what’s wrong with this preview of Those Who Rise by J Dolores Perry. 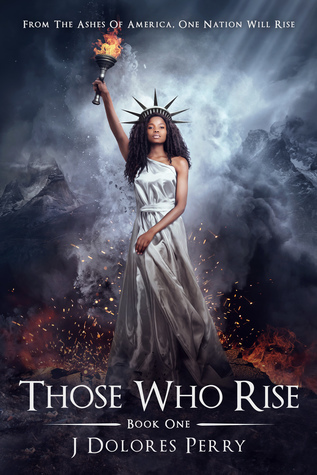 Due to the romantic and political subplots that are covered in The Revolutionaries Series, Those Who Rise is recommended for readers who are sixteen and older. To ask other readers questions about Those Who Rise, please sign up. ****I received an advance review copy for free, and I am leaving this honest review voluntarily. I am seriously confused by this. But right from the start, I want to say that this was a very pleasant read which surprised me. However, there are certain things I need/want to point out, but I would say that those are mostly minor things. I’m certainly going to read the rest of the series because the end was just shocking, and I need to find out more. Oh, and did I forget to mention that the cover is ****I received an advance review copy for free, and I am leaving this honest review voluntarily. Oh, and did I forget to mention that the cover is gorgeous? It's gorgeous! I was surprised how much I liked Taylor, she was generally very likeable character which felt surprisingly real. Not some overly strong superwoman. I felt so bad for her when she was forced to accept her role. And when her mum basically told her “just make him happy.” I wanted to take Taylor out of the story and protect her from all evil. It was so hard to watch, and I’m surprised that she was the only one who had a problem with it. However, the one issue I had, not only with her, was that they were sneaking around/doing something they should not and they kept yelling or screaming. I don’t care how scared you are or whatever, if you do not want to get caught, you do not yell. The action starts right at the beginning, so, at least there is always something happening, and I was focused on the mystery. However, I have to say that from the beginning I was a bit confused and I had so many questions regarding their society, how they work and why. Which was a bit confusing at first and it even seemed like maybe the author did not think about it. But when I’ve got past the halfway or a bit more, we got a bit of an information dump. And so many things suddenly started to get explained that I was struggling to keep up and even had to re-read some of it to make sure that I’ve got everything. I would appreciate if it was more spread throughout the story. The book is relatively short. Several more chapters to start the book more slowly and to explain things more at the beginning may go a long way. The main characters also attend school, and they are currently tasked to pass the final test which is based on struggles the original founders faced when they came. And I loved this idea; it was so fun. I would love to see the other questions the other teams got. But even here I have to question, how is it possible that some kids did not try to get the answers back at home, their parents had to pass the same test. Big potential for cheating if you ask me. Some other questions I have or some observations I would like to share but could be a bit spoiler-ish. Better safe than sorry. (view spoiler)[Okay, so the Fallen are Christians. What about other religions? Were the people specifically chosen that no other religion was included? I cannot buy that some Fallen families were taken and promoted to Founders. Every single person had to see it happening. And I can get that they were threatened into silence but what about the other Founders? Do they want their children, unknowingly, mix with Fallen’s children? Don’t they suspect that maybe that those Fallen did not leave their faith behind? Which sort of showed to be true with Priya (their teacher) revealing herself as a Christian. They failed, they only managed to force the Christian to hide their faith if they wanted to move past their caste and now you can imagine that Christians might be almost everywhere. A serious flaw in the system. Also, it seems that people can move from Fallen into Reformed by marriage. But the marriage is agreed to by their parents. So, how does this work? Children are brought up in a religious family, but then they are “forced” to marry someone and leave their faith behind? Or at least hide it? When Teresa gave those books to Taylor, it was just stupid, especially Bible. If someone saw Taylor with it… I can only imagine that she would be executed pretty fast. Also, she then took the Bible with her, to school and took it out of her bag. For everyone to see! I would expect more common sense from her. I was so excited when I first came across this read. A Christian dystopia!? I th I received an ARC of this book via BookSirens in exchange for an honest review. Thank you! The story concept really is quite good, but I felt like the book was missing some, hundred pages of description, and detail. Many things were merely brushed upon, then pushed back into the shadows where they remained in murky despair, desperate for more page time. The characters, community/setting, and world-building lack so much. Really, everything needed a lot more detail. This is why I have rated this book 2.5 stars, as it is compelling, but not descriptive enough to really sink me in---I could feel the heart, but not the body. Even though Those Who Rise has some faults, it provides is a chilling view into a future that follows some current trends happening and being pushed in society today against religious freedom for Christians. *Disclaimer* I was given an advanced copy of this book on behalf of the author to review. This does not affect my thoughts or ratings of the book. For a book that is recommended for readers 16-years-old and older, it reads more like for someone who is in their very early teens. I got to chapter three before giving up because I got very tired of the main character making a big deal of not wanting to kiss her fiance despite the fact they would be married in less than a year. All-in-all, I just did *Disclaimer* I was given an advanced copy of this book on behalf of the author to review. This does not affect my thoughts or ratings of the book. For a book that is recommended for readers 16-years-old and older, it reads more like for someone who is in their very early teens. I got to chapter three before giving up because I got very tired of the main character making a big deal of not wanting to kiss her fiance despite the fact they would be married in less than a year. All-in-all, I just did not want to force myself to read this as it was nowhere near what I was hoping or expecting, nor did it seem like it was going to get there. In Those Who Rise, we meet sixteen year old Taylor, who is at the top of the food chain, so to speak. She is a Leader, one of the elite social group that controls their society, and she’s been taught to look down upon, and even pity, the “Fallen” people Christians aren’t just hated, they’re killed. Not in masses, that would be too detrimental to the human population; no, they’re singled out, slowly selected by the ones who are too “weak” to follow the rules that ban public display of their faith. I'm sorry Jessica, I didn't really, I've just always wanted to say that!!! Hahaha. I actually thoroughly enjoyed this book, so much so that I read it in 3 hours. Now, for those of you who know me know that I am the worlds slllllllooooooooowest reader. I mean, did i mention it once took my a year to read Harry Potter and the Philosophers Stone? I know, don't judge. I have improved immensely. So for me to read this in just a few hours, says something about the story don't ya think? The best way I can describe this book is 'Divergent meets/vs The Church'. Doesn't sound like something compatible right? Sounds rather odd? But let me tell you something now - it totally changed my opinion and view on Christian literature. Divergent and the whole Dystopian genre is fantastic, but you seldom get a Christian Dystopian novel, but Jessica, girl, you made it work. So a little background, but not too much as I don't want to spoil it for ya'll that haven't read it yet/ won't be able to read it until April. This novel is set in the future where Christianity and Religion have been overthrown and banned from communities and households. There are different factions or 'castes' in this community - those that hate religion and punish those who practice, they are The Founders of this new world. The lowest of the community, The Fallen, they are the Christians. The story follows a young girl named Taylor who is not only a Founder but a Lady-in-waiting to the next Leader. To be able to graduate from school, her class has to mix with other castes to complete a task, and Taylor befriends some Christians and they help to uncover some truths about her family, her community and about this unspoken 'God of the bible'. Clashes happen, fights break out, threats surface and secrets are uncovered. Taylor finds herself torn between the truth of her existence, the truth about God and the will to survive and avoid the execution of not only her family and loved ones, but of her own life. - Did I mention Christian Dystopian, Divergent meets Church-ness? All in all, a very enjoyable book. If you are a fan of Divergent and of Ted Dekker's books then this is one for you. I highly recommend. Thank you Jessica for the opportunity to read it before release! This review has been hidden because it contains spoilers. To view it, click here. I received an advance review copy for free, and I am leaving this review voluntarily. The following is composed of my personal opinions and honest analysis. Those Who Rise by J Dolores Perry was unpredictable and captivating. BradCom is divided into castes that punish those who choose faith; the Fallen must decide whether they will die, reform, or hide. It's Taylor's duty to expunge religion and oversee the survival of her society as a Founder; however, she starts to question this role after a cl I received an advance review copy for free, and I am leaving this review voluntarily. The following is composed of my personal opinions and honest analysis. BradCom is divided into castes that punish those who choose faith; the Fallen must decide whether they will die, reform, or hide. It's Taylor's duty to expunge religion and oversee the survival of her society as a Founder; however, she starts to question this role after a class project requires her to work with lower-tier classmates. Delving into a world of secrets and forbidden relationships, Taylor soon realizes that her life was built off of lies. In a world where war divides the country it is necessary to ask: will faith be enough? "From the moment that I was born, I had been told that God had no place in our community. But... I started to feel like I had no place in their personal lives. If they wanted to pray with their own people, I wasn't going to stop them." I'm not religious, so I don't intentionally read books that are meant to be. Nevertheless, while reading this novel, I found it hard not to be inspired by Taylor's growth; she developed her faith and found fulfillment in doing so. While I can't see myself turning to theology for answers, it is still pleasing to know that she had ultimately found her haven in a place of love. "I was surrounded by strangers, but I finally felt like I belonged." The world building was fairly average. I love historical contexts in books, but I feel like Perry could have found a better way to distribute the information she gave us. One could argue, though, that we got to experience the same confusion and understanding as Taylor- furthering the connection between the reader and protagonist. The descriptions of BradCom were limited but all the more substantive in accessing the community's size. I feel that the author did a great job of preparing the reader for a second novel: the discovery of a religious war, secret cities, risen friends, and exposure to truth's consequences. I never understood why the Fallen were given a chance to be Founders after the Grey Plague. I think the book was trying to explain that it had something to do with the population difference. Even then, why would so many people keep their secret- yes, they were threatened, but how could a handful of families dominate the actions of the masses? I also found myself lost during some of the climactic scenes. I would have to reread things and continue on for a few pages until I realized what had happened, and other times the book seemed to be overly simple and cliche. It should be noted that these occurrences had only happened a few times and didn't take away any interest I had in the book. Again, I'm not into religion based novels, but this story was one that was hard not to appreciate. I can't wait for the sequel! First of all I would like to give thanks to author @jdoloresperry for allowing me the opportunity to be able to review her book. My expectations for a good Christian dystopian book where, I must admit, not so high. The majority of dystopian books have similar story development and are somewhat predict . My expectations for a good Christian dystopian book where, I must admit, not so high. The majority of dystopian books have similar story development and are somewhat predictable. Those Who Rise pleasantly surprised me! The book follows the adventure of Taylor, a 16 year old girl engaged to the future leader of her community, that after finding a mysterious and confusing picture, her life is turned upside down...Everything she knew, everything she believed in is no more than a lie. What stared as a Graduation test, the Tanaka test, turns into a life or death journey where she will have to decide what’s most important to her... family, love, duty, or faith. I love how the author created a dystopian book that has a Christian message but not in a preachy way. This book has many good lessons and you can even relate to many of the things Christians are going through today in our society; it really makes you reflect on how without Jesus as the foundation of a society we become senseless people filled with hate, that, in the end, bring grave consequences to everyone around us. The story and character development were so good I read the whole book in 24 hours! I couldn’t stop! I really hope that there will be a sequel! I’m dying to know what happens next! A group of people being the only survivors in America after a war, a government based on castes, a secret about the rest of the world waiting to be told–all these sound familiar, right? Perhaps even overused, and unoriginal. However, castes that are based off of faith, and a book that talks HEAVILY about discrimination towards Christianity, and real characters who discover their faith? It's something rarely seen. In Those Who Rise, you'll find the perfect balance of faith, romance, and intrigue. A group of people being the only survivors in America after a war, a government based on castes, a secret about the rest of the world waiting to be told–all these sound familiar, right? Perhaps even overused, and unoriginal. However, castes that are based off of faith, and a book that talks HEAVILY about discrimination towards Christianity, and real characters who discover their faith? It's something rarely seen. 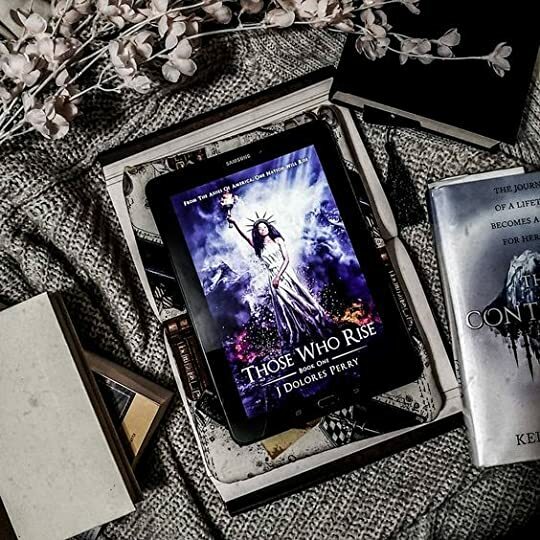 In Those Who Rise, you'll find the perfect balance of faith, romance, and intrigue. The book opens up about many, many important topics that are rarely delt with in mainstream books. Among those: faith, and pressure in relationships. Taylor is sixteen, engaged, and a *complete* atheist. She's been taught that Christianity is what led America to destruction, and she believes it blindly. At least until she finds a picture that unravels a web of lies. What I loved most about this book were the references to The Bible, and God. They hit the nail on the head, and made me want to say "Amen" out loud. I loved seeing the evolution of certain characters beliefs, and I can't wait to see who accepts the truth and who doesn't. My one complaint is that the book wasn't long enough! I'm sorry that you guys can't read this book yet, since it's releasing in April, but I DEFINITELY recommend you guys add this to your priority TBR. It's not only a clean book, it's a Christian book. I'm rating it ⭐⭐⭐⭐⭐5/5 . With this exciting story, Those Who Rise immediately caught my attention with the the plot. I loved this dystopian world with the intricate society of the Fallen and Founders. Those Who Rise was definitely a new take on Christianity and Atheists that resulted in a divided world. I really enjoyed learning about Taylor's past and who she is. Throughout the novel, she embarks on a journey of self-discovery and learns about those around her. I applaud Taylor for standing up for herself, even when eve With this exciting story, Those Who Rise immediately caught my attention with the the plot. I loved this dystopian world with the intricate society of the Fallen and Founders. Those Who Rise was definitely a new take on Christianity and Atheists that resulted in a divided world. I really enjoyed learning about Taylor's past and who she is. Throughout the novel, she embarks on a journey of self-discovery and learns about those around her. I applaud Taylor for standing up for herself, even when everyone encouraged her to "give him (her fiance, Britton) what he wants". She discovers who she is in Christ, who her friends are, and she also discovers the need for a united society. Meeting Isaiah's family was delightful and an important part Taylor's journey. I was a bit disappointed in the relationship between Isaiah and Taylor. It felt like they were in a relationship simply because. Isaiah and Taylor were stronger separate, not together. I have a feeling that this will change in the later books of the series though. That cover is amazing! It matches the mood of the story perfectly. Those Who Rise releases on Tuesday, April 9, 2019.